The ascent up Diamond Head begins. Notice that there is little shade and the path leads to many switchbacks winding its way up. For your safety and to prevent erosion be sure to stay on the trail and not make your own shortcut. Diamond Head estimated to be 200,000 years old and was created in a series of eruptions from the Ko’olau Volcano which has been extinct for 150,000 years. Other famous Hawaii landmarks created by this “Honolulu Volcanic Series” are Punchbowl Crater, Hanauma Bay, Koko Head and Manana Island. The trail starts nice a even walking on a paved path. The green trees you see are Kiawe trees whose wood is used to cook many foods and add flavor. 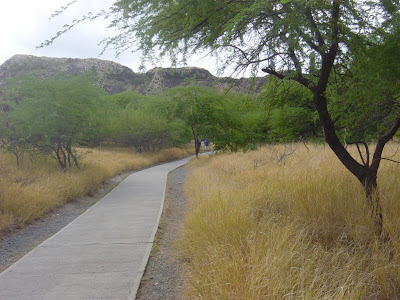 Soon we will begin the ascent up Diamond Head. 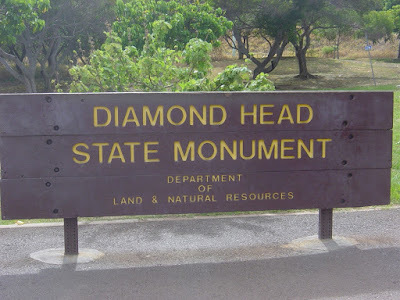 The Diamond Head State Monument hike starts here. 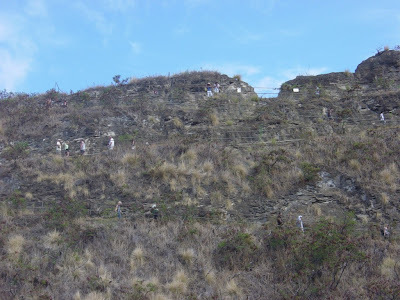 The hike is about 7/10 of a mile (1.1 km) and leads to the crater’s rim. The trail is a bit uneven at times and goes through a tunnel about ascends 173 steps to an observation platform. There is hardly any shade so we recommend a hat and be sure to carry water. Its a pretty safe hike for all ages in the coming days we continue up to the summit.